Dr. Andrew Day is an endocrinologist who practices at UCLA Health's Santa Clarita clinic. Dr. Day received his medical degree from the Temple University School of Medicine. He completed his internship and residency in internal medicine at the University of Wisconsin, Madison. He moved to the University of California, Los Angeles to complete a fellowship in endocrinology, diabetes, and metabolism. He received his undergraduate degree from the University of Chicago, where he graduated with honors. Prior to pursuing a career in medicine, Dr. Day participated in research that studied the associations between sleep and metabolic health. 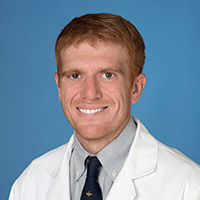 Dr. Day has an interest in medical education and is involved with the David Geffen School of Medicine at UCLA. Dr. Day was born and raised in Wisconsin. Outside of medicine, his interests include travel, reading, baseball, camping, hiking, kayaking, and enjoying the arts. In type 1 diabetes, the body can’t make insulin. Insulin is needed to help sugar (glucose) enter cells for energy. Read on to learn more about this condition that often develops in children or young adults. When your body can't make enough insulin or can't use insulin, it is called type 2 diabetes. Insulin helps the cells in the body absorb glucose, or sugar, for energy. Without insulin, glucose builds up in the blood resulting in high blood sugar. Parathyroid glands produce parathyroid hormone, which plays a key role in the regulation of calcium levels in the blood. Precise calcium levels are important in the human body, since small changes can cause muscle and nerve problems. Detailed information on pituitary gland disorders, including acromegaly, diabetes insipidus, empty sella syndrome, hypopituitarism, and pituitary gland tumors. Day A, Yeh M, Livhits M. Surgery for Hyperthyroidism Lowers Cardiovascular Mortality Compared with Radioactive Iodine. Clinical Thyroidology. Jan 2018; 30: 15-17. Grock S, Day A, Bhat S. Two cases of impaired sensitivity to thyroid hormone with wild-type THRβ gene. Clinical Thyroidology. Aug 2017; 29: 318-321. Broussard J, Kilkus J, Delebecque F, Abraham V, Day A, Whitmore H, Tasali E. Elevated ghrelin predicts food intake during experimental sleep restriction. Obesity. Jan 2016; 24(1):132-8. Broussard J, Chapotot F, Abraham V, Day A, Delebecque F, Whitmore H, Tasali E. Sleep restriction increases free fatty acids in healthy men. Diabetologia. Apr 2015; 58(4):791-8. Pamidi S, Wroblewski K, Broussard J, Day A, Hanlon E, Abraham V, Tasali E. Obstructive sleep apnea in young lean men: impact on insulin sensitivity and secretion. Diabetes Care. Nov 2012; 35(11):2384-9.